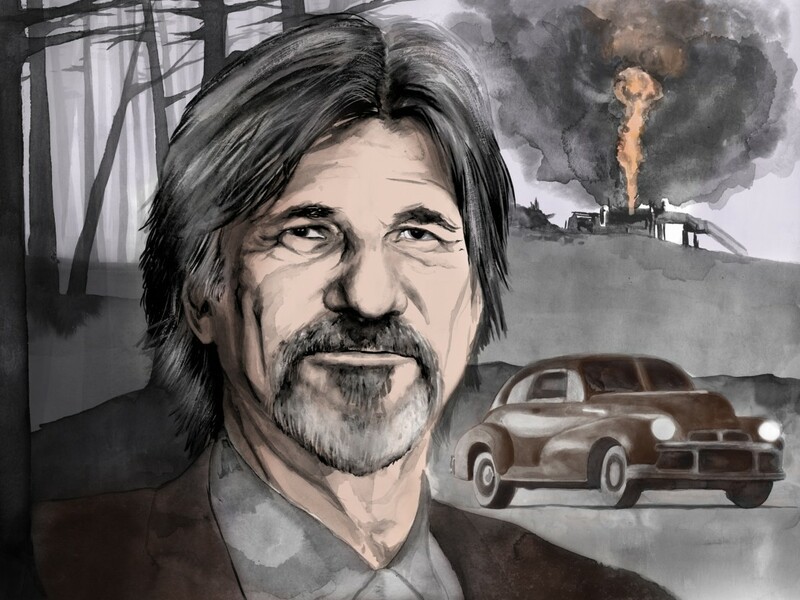 From having worked in the film industry for over 50 years, Jack Fisk has gained a reputation as being the modern Michelangelo of cinema production design. Though he started out art directing low-budget B-movies, his first major credit was on Terrence Malick’s Badlands, and from that point Fisk seemed to become more selective about his collaborators. 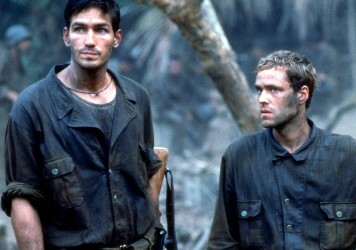 During the ’80s he tried his hand at directing, but then from the early ’90s to the present day, cemented his reputation as a production designer of real distinction, working with the likes of PT Anderson, David Lynch and everything Malick has made since 1998’s The Thin Red Line. Fisk’s work is vital to the success of Alejandro González Iñárritu’s The Revenant, as he made the film feel like a genuine trip back in time. LWLies: How big a part does strict historical accuracy play in to your work? Fisk: Historical accuracy is really important to know about. I do a lot of research. Then, when I’m actually making the film, I try not to rely on it so much. I make information a part of my DNA. One of the things I try to avoid is making something that looks exactly like that period at a specific time and place. I want my work to be more universal and timeless. Sometimes you have to destroy reality to be able to tell a story. I see so many recreations of the world at different times, that the public are shown every day, and I try to re-write those a little bit. I like to make things a little more inaccurate. How accurate is the wooden fort featured in The Revenant? I was researching forts made during the Lewis and Clark expedition at the beginning of the 19th century. They were nothing like the forts I’d read about. When I talked to people making those forts now, they make them with all kind of modern additions so they pass code, and they have to last for 20 years. I tried to build a fort like the trappers would’ve built it. In my life time, the world has changed quite a bit. People used to bathe once a week and now they bathe every day. Closets are filled with clothes. If you look at old houses, there are closets that fit maybe two dresses and a Sunday outfit. They go to bed when it’s dark. They read by candle light. They got their news piecemeal. We forget how far we’ve come in the last 400 years. I hope to be able to remind people by creating these worlds. When you sign up to do a movie, what’s the first port of call for you? Is there a book you always reach for, or a library you always head to? It depends on the film. In the old days I used to go to research libraries that they had at the movie studios. Now it’s the internet. I download a series of books that I put on my iPad. I start reading. I look primarily for journals written by real people. Not so much where people have interpreted those journals – I like to do that myself. When I did The New World, and Jamestown, I read journals written by colonists, and we had to look at them a decide what parts of them were real and what parts had been manipulated by editors. What you could trust? People writing these journals didn’t know about architecture, so they might describe a fort as being round when in fact it was oval. You have to read a lot to try and decipher what people knew and what they could articulate. It’s exciting. It’s a mystery. Are images important? Do you create a mood board for each film? They’re great. Depending on the film, I try to collect images from the very beginning. I usually put them up on the wall of the art department, so that anybody who visits can enter into the world of the film. They’re a great way to start conversations. Alejandro [González Iñárritu] gave me a tape of the film Andrei Rublev, the Russian film, which he said was his favourite. I quickly realised it was the detail and the scale he appreciated in that film, and it was kind of the beginning for me. I know he likes things to be real, and I do too. 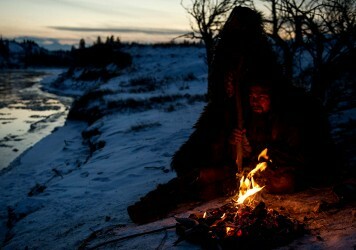 And it was a question of finding out what was available to the trappers during the period of the film. I try to make the film not look art directed. I don’t want things to look perfect, because life is not perfect. I remember I was looking at paintings by George Catlin of Indian homes, and then in my written research I found an army officer criticising Catlin’s paintings, saying the homes weren’t round, but more mis-shapen. His representations of the houses were heavily stylised – so it’s my job to undo that stylisation. I approach this work like an actor would – I try to put myself in the position of an explorer or a trapper or an Indian of the period. We have to try to know what they knew. When you made The Tree of Life with Terrence Malick you took over five whole blocks as a way for the camera and cast to achieve a 360 degree immersion. How do you define the borderlines of your work? Well, I like to build as much as I can. I’ve learned to build sets cheaper so I can build more of ’em. With Terrence Malick, I never know what he’s going to shoot. He listens to the environment. He creates everything in the moment. I’ve always learned to build more than the script asks for. With Terry, I’d say that he asks for nothing but expects everything. I try to give him the maximum. For The Tree of Life, we got people to park their cars a few blocks from their home. People weren’t so insulated back then. Kids could run from one yard to the next. It gave Terry great freedom. In the quiet light of the evening, he would just get out a camera and start shooting the streets. He’d have Brad Pitt wandering around, or one of the kids playing with a rock. With The Revenant, I had to build an entire fort, and I think it was as good as a fort that was built during the period. You could’ve lived in that fort if you were strong enough to live in that environment. It was cold, it smelled bad, it was infested with everything. Living up in Canada was a constant reminder of how it was to survive in those cold environments. Do you think people were tougher back then? I think so. If you went into the water you’d instantly freeze and die, but the trappers back then were going in to the water all the time. People were a lot more tough in those days. I know my grandfather was a lot tougher than I am, and his father was tougher than him. Things have changed. We’ve become smarter, but less tough. We’ve learned ways that we don’t have to be tough. But I’m pleased that I’m alive now and not back then. One of the film’s most arresting images in The Revenant is the one of Leonardo DiCaprio stood next to a tower of skulls. One of the first things that Alejandro said to me when I met him was that he wanted to have a mountain of skulls. He didn’t specify what kind of skulls. 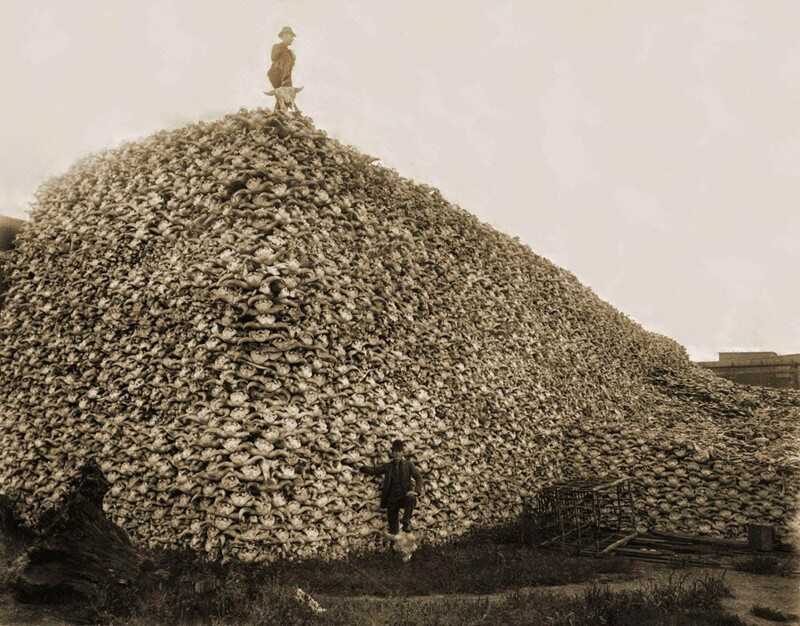 I found a picture from about 1850 of a man stood on a huge mountain of buffalo skulls. At that time, the United States government had encouraged people to kill buffalo, and it was a way to control the Indians. If they could take away their food source, then they could tell them where to live and move ’em around. It was a horrible situation. 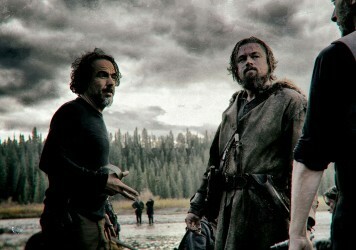 In the film, for me it signifies Hugh Glass [DiCaprio’s character] seeing into the future. Those skulls represented the end of mankind as we knew it at that point. Out of styrofoam. To make a pile that high would’ve taken about 10,000 skulls, and it would’ve been so smelly and awful we decided against it. We made five skulls, then just multiplied them. It’s actually just two sides of a pyramid rather than an actual pile, as we needed to be able to move it around. Because it was a fantasy sequence it wasn’t tied with any one location. We ended up filming it on the same location where Leo jumps over the cliff on his horse. It was filmed on a light snowy morning. I love challenges like that. I don’t see my job as creating worlds, but solving problems, and this was one that kept me up at night. Searching for sculptors in Calgary was so exciting for me. I recently saw the movie Terminal Island from 1973 about convicts escaping and living rough on a prison island. Did you learn anything on that film that applied to your work on The Revenant? Oh god… I can’t remember that movie. It was 45 years ago. I… don’t think that film affected me in any way. The first film that did was Badlands. Working with Terrence Malick made me realise that film could be a fine art, just like painting or sculpture. Film directors could be artists. Up until then I had worked on films made by Roger Corman, and their function was just as stories. But Malick’s work is art. Alejandro, David Lynch, Paul Thomas Anderson, they’re all artists. I find myself attracted to people who I respect as artists. You’ve worked on Malick’s Knight of Cups and his forthcoming film set in Austin. What’s it like for you to make work set in contemporary times? The challenge of working in the modern day for me is to make things visually interesting. Modern day is something you see all the time. So you have to take a location like Austin or Los Angeles in the case of Knight of Cups, and present it in a way that gets people to look at it again. Ten thousand films have been shot in LA, but you’ve got to get people to want to look at LA again. It’s more of a challenge for me. In some ways it’s not as rewarding for me because you’re finding things that already exist rather than creating something new. We never built anything for those films. We’d just… discover things. The Revenant is in cinemas from 15 January. Read our review here. The Revenant director offers a personal and profound response to one of life’s biggest questions.